Most of your clients probably already know that the rate of childhood obesity has reached a record high in this country. But what they might not know is that the steps to prevent it begin in infancy. Today’s Dietitian spoke with RDs who specialize in pediatric nutrition about the dietary and caloric needs of infants and toddlers and how the foods parents introduce to them can shape their eating habits and relationship with food for a lifetime. Dietitians have a vital role in helping parents instill healthful eating habits in their children that will have long-term positive effects on their overall health and well-being. Joanna Dolgoff, MD, a pediatrician; child obesity specialist; author of Red Light, Green Light, Eat Right; and spokesperson for the American Academy of Pediatrics (AAP), says RDs must work with parents to teach their children healthful lifestyle and eating habits they will build on and follow for life. “It makes sense that children are more likely to become obese when they have obese parents,” Dolgoff says. “This is linked to genetics, dietary patterns, physical activity, and parent-child relationships. Let’s face it—children often model what their parents do.” That’s why parents of children transitioning from infancy to toddlerhood should choose healthful, nutrient-dense foods and maintain an active lifestyle themselves while encouraging their kids to do the same. “It’s difficult to change unhealthful habits as we get older, but if children learn early how to make the proper choices and become familiar with eating healthful foods, they’ll be more inclined to continue to eat in a healthful manner as they grow and become teenagers,” Dolgoff says. Between 4 and 6 months of age, babies will be ready to start solid foods. However, they’ll continue to get most of their calories, proteins, vitamins, and minerals from breast milk or infant formula, says Vandana Sheth, RD, CDE, a spokesperson for the Academy of Nutrition and Dietetics (the Academy). “This is a good time to introduce iron-fortified infant cereals—rice, barley—or puréed meats to help restore diminishing iron stores,” Sheth says. Infants generally don’t consume dietary fiber for the first six months of life, but as complementary foods are introduced to the diet, fiber intake increases. “It’s recommended that from 6 to 12 months of age, parents slowly introduce whole grain cereals, fruits, vegetables, and legumes to provide 5 g of fiber per day by 1 year of age,” Dolgoff says. To ensure adequate calcium and vitamin D intake, milk should be an important part of a toddler’s diet. According to Dolgoff, the AAP recommends vitamin D supplementation of 400 IU per day if a child is drinking less than 1 L (about 4 cups) of milk per day. In general, kids aged 12 to 24 months should drink whole milk to help provide the dietary fats they need for normal growth and brain development. After age 2, most kids can switch to 1% or nonfat milk. It’s important to tell parents that after the rapid development experienced in the first year of life, the growth rate slows during toddlerhood. That’s why it’s imperative for parents to minimize the intake of sweet drinks, snack foods, and desserts because children’s stomachs can fill up quickly, limiting room for the more important nutrient-rich foods. According to a study published in the January 2004 issue of the Journal of the American Dietetic Association, 30% of children between 19 and 24 months of age consume candy, pizza, chicken nuggets, soda, chips, and hot dogs. Feeding toddlers table food is simple, Johnson adds. They don’t need elaborate cooking methods or added flavor. Mashed beans, boiled eggs, yogurt, ripe whole fruits, and cooked veggies will suffice. “The problem is [children] like to imitate, so if they see their family eating French fries, they too will want a French fry,” Johnson says. That’s why RDs should help parents establish a nutritionally balanced week for their toddlers, not necessarily a balanced day. Parents also should keep in mind that introducing their children to new foods for five to 14 days is an effective way to help a child overcome his dislikes. 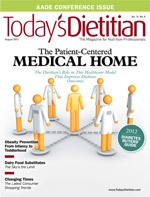 Karin Ballard, MS, RD, LDN, a pediatric dietitian at La Rabida Children’s Hospital in Chicago, says RDs can further address the issue of picky eating by incorporating Ellyn Satter’s Division of Responsibility in Feeding initiatives, which help parents provide the structure, support, and opportunities for their children to eat nutritious foods. The initiatives make children responsible for how much they want to eat and whether to eat what their parents provide. In other words, parents are in charge of feeding and the child is in charge of eating, Ballard explains. This means that parents decide what to serve (a variety of healthful foods and drinks), when to serve it (scheduled meal and snack times), and where to serve it (preferably at the kitchen or dining room table with limited distractions). Preventing overweight and obesity starts during infancy. According to Early Childhood Obesity Prevention Policies, a report published in June 2011 by the Institute of Medicine, exclusive breast-feeding for the first six months of life and continuation of breast-feeding in conjunction with complementary foods for one year or more can prevent childhood obesity. If a parent can’t or chooses not to breast-feed, it’s important to pay close attention to infant hunger and satiety cues and avoid forcing an infant to finish a bottle. • Grains: 3 oz of grains, of which one-half should be whole grains. This is equivalent to approximately three slices of bread or 1 slice of bread plus 1/3 cup cold cereal and 1/4 cup cooked rice or pasta. • Vegetables: 1 cup raw or cooked vegetables. • Fruits: 1 cup fresh, frozen, canned, dried, and/or 100% fruit juice. Whole fruits rather than juice are recommended. • Milk: Two cups per day. For children under age 2, whole milk is recommended. Older children can switch to low-fat/nonfat milk, yogurt, and cheese. • Meat and beans: 2 oz from lean meat, chicken, eggs, fish, or beans. • Oils: 3 tsp or fewer per day. In a medium saucepan, melt the butter over medium heat. Whisk in the flour. Add the milk. Cook and stir until the mixture thickens and comes to a boil. Lower the heat, add the cheese, nutmeg, salt, and pepper. Cook and stir 2 minutes. Add the pasta and peas, and mix gently. 1. Institute of Medicine. Early Childhood Obesity Prevention Policies. http://www.iom.edu/~/media/Files/Report Files/2011/Early-Childhood-Obesity-Prevention-Policies/Young Child Obesity 2011 Report Brief.pdf. June 2011. Accessed June 5, 2012.